Financing: Retos-Colaboración Programme. R+D National Plan 2013-2016. Economy and Competitiveness Ministry. FEDER funds. The main objective of the HELIODRON project is to develop a 2 meter wingspan Remotely Piloted Solar Aircraft that will be equipped with specific instrumentation to perform different surveillance missions. It will be useful not only for prevention, but for the management of incidents and disasters that may occur. The advantages of this type of aircraft over other surveillance systems are mainly its low manufacturing and operation cost, their fast availability and its long autonomy. 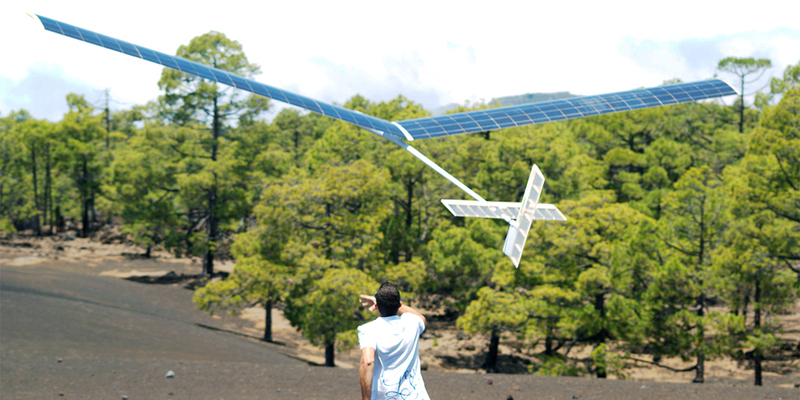 The solution adopted beforehand is a 2 meters wingspan solar aircraft, designed for a flight altitude of up to 3,000 meters and a maximum operating speed of 20 m/s with fast availability. In addition to the solar aircraft prototype, the specific instrumentation required to carry out the surveillance mission will also be developed during the project. It should be noted that the project requires specific developments to meet the peculiarities of solar energy, which allows a larger flight autonomy, essential in such surveillance missions, while imposing restricting weight and energy consumption conditions to all onboard equipment. The consortium committed for the development of the HELIODRON project is integrated by ITER, the Fundación Centro Tecnológico de Componentes (CTC) and Aerosertec. CTC will be responsible for the development of the low cost, small size and low consumption redundant navigation system which will be able to offer better accuracy than more expensive commercial systems . Regarding solar aircraft for disaster surveillance and management, the proposed navigation system means a significant improvement versus the use of a low-cost commercial system , as it also increases the integrity level, and the accuracy and availability of the solution under any circumstances. It directly means a better geolocation of singular points, providing a rapid response and a better management of the the emergency services available resources. Aerosertec will be in charge of the structural design of the aircraft, which in this specific case requires extremely light and robust materials. The consortium members expect to generate at least 2 patents, 2 direct jobs and 4 indirect ones with the development of the project.